There is something highly addictive about Indian food. In fact, ‘scientists’ (which is the BBC’s name for the odd creatures who typically spend four-fifths of their life trying to secure funding in order to research things that half a dozen people in the world care enough about to bother reading the findings on; not that important matters have typically been the concern of the majority) like a crew at Nottingham Trent University a few years back claim that ‘just thinking about eating a curry can make people feel high and eating it arouses the senses and makes your heart beat faster’. But I‘m not concerned here with that kind of addiction. Rather, I’m concerned about the addiction that attends cooking Indian food. There’s something about the range, the texture and the colour of the various spices, about a home (and a human nose) coming alive with exotic aromas from ingredients grown 14,000 kms away, about the wonderfully friendly and cricket-loving people who run those funky little Indian food marts, and, of course, there’s the thrill – as brimming with eschatological hope as anything ever was – that drives one to produce a curry as near perfect as creatures living anywhere north of the Bellingshausen Station are capable of. Like the thrill of anticipation that attends catching a trout on a fly pattern that you had tied yourself, so too is the joy of creating your own curry recipe (as opposed to simply copying one from some tried and true volume by Camellia Panjabi or Pushpesh Pant). 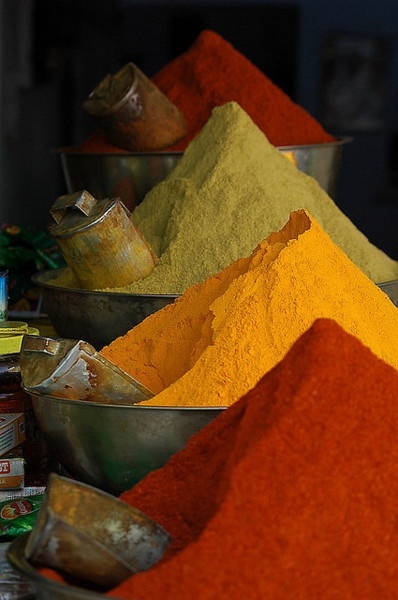 There’s something gloriously physical, too, about preparing Indian dishes. You are involved in the process from go to whoa in ways that many other forms of cooking don’t seem to invite nearly as much. Cooking Indian announces to the cook – and to all who have eyes to see and noses to whiff and palates to tingle – that the only creation worth celebrating, the only creation that is, is the creatio continua. Cooking Indian, in other words, is a prophetic act which exposes the joyless lie of deism and celebrates the joyful freedom of the God of spice. To be sure, such an act of (sub-)creation, of participation in the movement of Spirit in creation – like that which attends fly tying – requires some time-consuming research, patience, and sometimes a few doozies along the way, as with many of life’s most valuable gifts. But the rewards are obvious to all who so venture out (and hopefully to those they cook for as well!). Had I an editor, s/he would have no doubt deleted the previous paragraphs laden as they are with mixed metaphors and superfluous waffle irrelevant to any definition of a point that this post purports to be about, and demanded that I make plain this post’s purpose in ways that demand less ink and much less of the reader’s patience and time and theological lexica. But I don’t have an editor, so they’re staying put. And having now released a few things off my chest, I am delighted to share a wee recipe – one in progress, for are not all recipes symbols of the provisionality and, in some cases, the idolatry of our attempts at meaning making and of our strange groping for the Bread of Heaven? 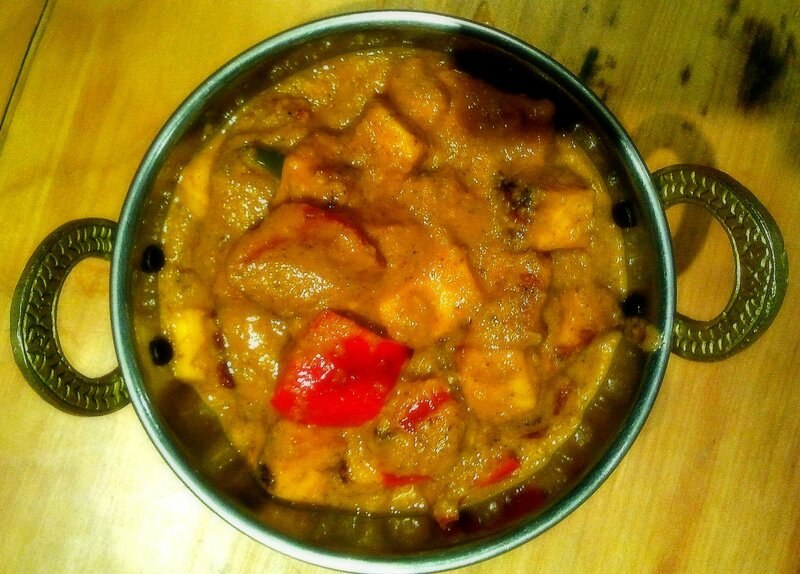 – for Paneer Tikka Masala. I do so with no apologies in advance for the inconsistent use of measurement systems (something that I’m confident that my intelligent readers will be able to cope with), and with a caveat lector around the fact that I reserve the right to edit the recipe as I further tweak it. Cooking as creatio continua. By the way, I’m always keen to hear from readers who give the recipes posted here at PCaL a go, and/or who have suggestions arising from their own culinary efforts. 1. In a non-reactive bowl, marinate the paneer and capsicum in the ginger, garlic, cumin, paprika, chilli powder, garam masala and yogurt. Mix well, cover, and refrigerate for a couple of hours. Pour yourself a drink. 2. When you’re ready to cook, it’s time to make the masala. Over medium heat, heat the olive oil in a large lidded pan (I use a large cast iron French oven made by Le Creuset. It has not failed me yet, with any dish). When the oil is hot, put in the onions, and stir until they brown (about 8–10 mins) but don’t burn the little fellas. Then add the ginger and garlic and keep stirring for about a minute. Then add the turmeric, chilli powder, paprika, coriander and cumin. Stir for about 10 seconds, and then add 1 tbsp of yogurt. Stir until it is absorbed (think stock and risotto! ), and add the remaining yogurt in the same way – a tbsp at a time. 3. Now add the tomatoes, stopping along the way to give thanks to God for these amazingly versatile little friends, and then fry them for 5–6 minutes on low, or until they turn pulpy. Then add the stock, salt, and tomato puree and bring it all to a gentle simmer. Cover, reduce the heat to low, and simmer gently for 20 minutes, or until the sauce is as thick as a stubborn Methodist (OK, not quite that thick. Think, instead, of somewhere between a nice creamy Anglo-Catholic, that all-too-rare breed of high-church Presbyterian and an ol’ time charismaniac. In other words, thick but thin too. Better still, just think cream.). Stir in the kasoori methi, garam masala and chopped coriander leaves, and, checking the flavour, add more salt if needed. Add the cream, stir gently, and simmer uncovered on very low. Refill your glass and put on some Iris DeMent. If you’ve made it this far and it’s not looking like a complete disaster, then you’re a champion. 4. If you’re someone who likes super smooth gravy, then now is the time to set the blender onto the sauce. After blending, keep it simmering away on very low while you attend to step 5. 6. Garnish with more chopped coriander leaves (if you’re into pretty food) and enjoy with naan or roti or rice (my preferred type of which is Sona Masoori). More importantly, enjoy it with friends and/or enemies. I find spicy food doesn’t agree with me. I’d much rather eat Mum’s bread and butter pudding. I’m a very mediocre cook – as my family will attest. I look forward to trying out some new food though!